An Easy Baked Potato Soup Recipe that appeals to every appetite. 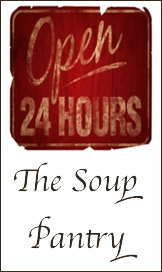 Quicker than you think you can be serving a cheesy potato soup complimented with traditional baked potato toppings. Who doesn't love a loaded baked potato? In just under 30 minutes cooking time (if using previously baked potatoes) the family will be sitting down to this scrumptious loaded baked potato soup. Super thick and chunky, this hearty soup is served dressed for dinner and appeals to every member of the family, and you probably have all the ingredients in your kitchen right now. This is a great one pot meal for the teen crowd. It'll fill them to the brim and they LOVE it. Pierce potatoes and bake in oven at 350F for 1 hour or microwave, on high, for 10 minutes (a potato is cooked when it "gives" when squeezed in your oven mitted hand). Set aside 'til cool or overnight. Fry bacon in a large skillet until crisp. Remove bacon strips, reserving bacon drippings. Drain, crumble and set aside. Into the bacon drippings, add enough butter so that the fat equals 4 Tbsp.. Add the onion and garlic and saute' for 10 minutes ('til onion is transparent) at medium/low heat. Sprinkle the flour over the onion mixture, stir and cook for 3 minutes. Add water 1 cup at a time mixing constantly with a wire whip until fully incorporated and the mixture is smooth and thick (like pancake batter). Stir in herbs de provence, bouillon cubes, bacon (reserve 1 Tbsp for garnish), salt and pepper and simmer for 5 minutes. Chop potatoes into cubes and add to mixture - I leave most of the peel on, you can remove it if you like - heat through. Add cheese (reserve 1 Tbsp for garnish) and stir 'til melted then add sour cream and heat without boiling. 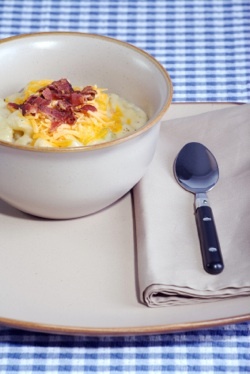 Ladle into bowls and garnish with reserved bacon and cheese. Enjoy steaming hot with warm multi grain crusty rolls. Great kid meal for a sleepover. Offer a variety of toppings like sliced green onions, sour cream, jalapenos and cheeses.